Low price, excellent built quality, beautiful design with unique looks, fantastic sounding player, serious reliability issues, but who cares it has a very low price tag and sounds better than 99.9% of other CD players. A true Classic! Best CD player for the money. I let mine play for a week before I did any critical listening. Great soundstage and separation of instruments. Drums and bass sound authoritive and realistic. Complex bass lines and drum beats are easily reproduced without mudiness or boom. Overall character, tone and phase are very good. Male and female voices appear natural without any signs of nasal honkiness or chestiness. Very warm sounding and engaging. Some may say polite with quieter styles of music. This player came into my system to replace the very highly regarded Meridian 508.24. 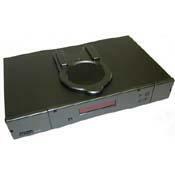 When I bought the Meridian, I marveled that it was the first cd player which did not fatigue me. My cd spinner priorvto the Meridian was no slouch, either, a CAL. But after many happy years I yearned for more. Specifically, I was critically aware that the Meridian lacked the drive, oomph or pace of my LP system. Pace? My thoughts turned to Naim, Linn and Rega. Having owned Rega gear in the past I wanted to try the Apollo. I enjoy this player more then I did the Meridian. It has the pace I wanted and is by no means harsh. It is a fine tonal match for my lp system (lp12/ekos/arkiv ii/lingo feeding a Pass phono stage) which is what I wanted. Do think my lp system has some superor qualities to the Rega, but I never consider my lp and cd system as out of sync with each other in terms of tonal quality. Both rock when needed, both can be very immediate, throw a convincing soundstage and grip the music. With the right tune, the right volume, I not only hear the music through the Rega, but I feel it as well. As a side note I use a homemade copy of the Rega Couple interconnect (Klotz cable and Neutrik Profi plugs) which is quite good and the parts cost about 1/4 of what a ready made set of Rega Couple retails for. Rock solid sound at a very affordable price! I'd say 95% there! High end is smooth and detailed without being rolled off. I have a slightly bright system and this player works very well together. I can listen for hours without getting fatigued. Mids are liquid smooth with realistic sonic weight. The pace of the player is correct. The more you listen the more you want to. Flushes out a good bit of detail without sounding analytical. The titanuim tweeters in the main speakers are pretty unforgiving. If this player had any top end harshness it would be revealed easily in this system. Bass is pretty good but that is why I said 95% there. The bass is a tad lighter than other players I have had in the system. If you have a subwoofer then you can adjust accordingly. The quality of the bass is great as far as being musical. It just the authority that could be a little better. Not a deal breaker by any means. After all we are talking about a player that retailed for 1K. Can't expect perfection at this price point!. I love the reaction of people that see this player. Usually comments are...Wow that is a really cool looking cd player! A great bargain on the used market. Highly recommended! I've had a few cd players thru my system and most in this price range are harsh! The rega gets 95% of it right. The mids and highs are very very sweet! I was hesitant to get this player as I have a system on the brighter side. Turns out this player is a good match for my system as the top end is smooth. Good detail without the associated rolled off top end! Also the signal to noise ratio of the player lends itself to the quiet around the music. Vocals are realistic with the right sonic weight. The bass is the only reason I said 95% there. It is just a tad light in this area. If you have a subwoofer then adjust accordingly. The quality of the bass is very good. Just not as authoritive as i've heard. I had a krell KAV 300 player that to this day had the best bass of any player to grace my system. The transport is dead quiet. I can't stand hearing transport noise and have nix'd players right away for this. Overall a very nice player that will stay in my system for a while! I love people's comments when they see it. Like wow that is a really cool cd player! Sound and looks at a very reasonable price!!! Generally solid. The waiting while it "INITIALISES" is very annoying. Very accurate. Would like some upsampling options. Like the top loading. One less part to break. Bottom line is it's one of the best sub $1000 CDPs out there although the new top of the line NAD is also quite good and is close. Auditioned this at a local audio shop. Heard it through a Rega Mira amp and R7 speakers, listening to a recent jazz vocals recording. First impression was 'wow'. The soundstage and imaging were unbelievable. To be more accurate -- they were actually believable: there was a holographic quality about it that put the vocalist, and bass and drums right in the room. The only thing was that at times the upper-mid range was at times just a little overstated -- but I understand the amp can influence that a bit. To compare, he put on the same cd on a Naim cd5i through the same amp and speakers. The first thing that I noticed was that the soundstage all but collapsed. That '3d-ness' just wasn't there in the same proportions. The sound was a bit warmer on the Naim and seemed to be a bit more balanced (not as much upper mid emphasis on the vocals). The bass was maybe a bit more weighty, but not by much. Overall I thought it wasn't as engaging as the Rega -- and preferred listening to the Rega. Got to bring it home for an audition for the weekend, which was very nice. Compared it to the Denon DCD-685, which we thought was pretty good (authoritative bass -- but maybe a bit unnaturally so). The difference was almost night and day. On a Bach sonata, the piano came alive on the Rega, where it sounded like shrouded or muted on the Denon. The notes came out ok on the Denon, but on the Rega you could hear all the characteristics of the piano. On an orchestral piece, the Denon did ok -- sounded good. But once heard on the Rega, it sounded like again a veil had been lifted. Whereas on the Denon all the notes in the piece could be heard, it wasn't until heard on the Rega that the sounds coming from the right channel were a mix of horns and strings (on the Denon it just sounded like strings, but more distant and hazy). In fact, the Denon just sounded more 'hazy' or unclear by comparison. On the Rega, music stands being moved about and sheet music being turned could be heard which was nice, with good bass, life and soundstage in the music overall. Finally, on the opening track of the second Arctic Monkeys cd, the instruments had more definition on the Rega (the guitar string plucks could almost be heard) and the music had more energy. I can see how the Rega can be described as more analogue. It has that sort of energy and presentation about it. Yet, it has all the benefits of detail and clarity that digital has to offer. Fantastic cd player. I'm already in love with this cd player!! Don't listen to any of the reviews below complaining about a disc not being able to be played because of scratches. My cd's are, admittedly, in bad condition, and I've not had a single problem playing any of my nearly 100+ discs. I did an A-B comparison with this cd player to a very nice turntable setup and the details that this cdp picks up are astounding. I was floored that the turntable with a very expensive cart missed on a lot of important sonic detail and I would say that the Rega was every bit as warm & smooth but with no veil. absolutely stunned at the results and I would highly recommend anyonoe try this fantastic gear. I'm new to hifi, but I know what sounds good and this is a keeper. my absolute highest recommendation. DO. NOT. WASTE. YOUR. MONEY. People who need to justify the exorbitant amount of money that they spent on this player will tell you that it is "fickle". No. It is WORTHLESS when it comes to consistently playing a CD. Regardless of whether or not the CD is new, scratched, original, or a copy, at some point this CD player will decide that it doesn't want to play it. This thing has one function -- ONE -- and it can't perform it with any consistency. An absolute disaster of a purchase. 2) Very slightly bass light, but I can put up with that: it's nice and tight and rhythmic. Firstly I think this is a great sounding CDP. Very musical, easy on the ear, yet still dynamic with lots of energy and detail. But now I have to point out its one weakness: it's susceptibility to RFI. My Apollo worked perfectly till I installed a broadband cable within about 14 inches of the back of the player. I used a telephone output socket that split the broadband signal to a seperate socket and then I used twisted pair type cable to connect to my computer about 30 feet away. The problem is that when the cable is connected and carrying the broadband signal, the Apollo takes ages to initialize and then jumps and skips while trying to play the music and randomly drops the sound out completely. So the player is totally unuseable with the cable running near the player. I can disconnect the cable and everything is great, but it's a bit of a pain doing that every time I want to play music. My only answer is to relocate the cable and or my computer or maybe use a wifi connection (but this might generate enough RFI to cause the same problem).